Anthony Brown and BC were riding a three-game winning streak at the time of his injury. 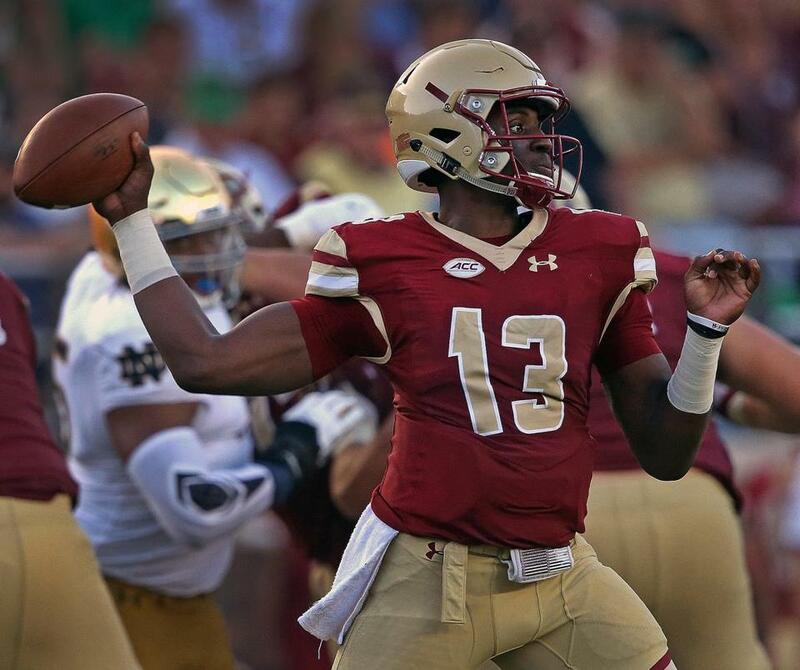 The fastest way for Boston College quarterback Anthony Brown to move forward was to steel himself and stare down the moment that cut his redshirt freshman season short just as he and the Eagles’ offense were tapping into their full potential. The full extent of the right knee injury Brown suffered against N.C. State last November was uncertain when he left the game, but after returning to the sideline on crutches, it was clear how severe it was. The GIF that came through his phone was merely confirmation. Brown watched himself run for 7 yards then saw his knee bend awkwardly then buckle as he tried to make a cut to put himself in the red zone. There was no contact. Just a violent contortion, his leg making a gruesome “L” shape before he fell to the turf. Eight months after season-ending surgery, Brown said he now can watch the clip without cringing. He’s seen it “a million times,” he said. If Brown never forced himself to watch the play, he’d still be questioning himself to this day. Even now, he runs through all the choices he had in front of him besides the one he made. “I know exactly what happened, but I just had to watch it to see how it actually looked because in my mind it looked a hundred times worse than it looked on camera,” he said. “I just watched it to see what I could’ve done different. Because I already know what was going on in my mind. I already know what happened. I just feel like now I’ve just got to learn from what happened. While the rehab process has been daunting and football activity has come in limited doses for the 19-year-old, Brown is on schedule to be fully cleared for practice when the Eagles open preseason camp. But the experience was new for Brown, who had never suffered a severe injury since the time he first picked up a football as a child. Watching the Eagles go on to their fourth bowl game in five years was perhaps more difficult than watching the play on which he was injured. The Eagles were riding a three-game winning streak when Brown went down. Brown was starting to hit his stride after throwing for 275 yards and three touchdowns against Virginia in late October. The injury brought it all to a halt, but Brown was itching to stay in the mix. There was no rush for Brown to return for spring practice. Eagles coach Steve Addazio encouraged Brown to focus on his recovery and his schoolwork. Brown also had an added advantage at home. Growing up in Cliffwood, N.J., many of the faces he was surrounded by went on to carve out careers in the NFL. His father, who shares the same name and played college ball at Georgia Tech, was close with Charlie Rogers, who spent five years in the NFL, as well as Jay Bellamy, who played for 14 years. And Brown’s mother, Carissa Henderson, had suffered the same injury in a workplace accident. The challenge was stopping himself from pushing too hard for a speedy recovery. Brown was able to lift weights during the spring. Running was limited to straight-ahead sprints. Watching teammates in the spring gave Brown a glimpse of the leaps the offense was taking and the potential the upcoming season holds. The Eagles’ offense has true weapons, starting with reigning ACC Rookie of the Year running back A.J. Dillon. There are pass-catching threats in graduate student tight end Tommy Sweeney, senior receiver Jeff Smith, and sophomore receiver Kobay White. The return of veteran center Jon Baker will give the offensive line the depth it lacked last season. At the same time, how the offense progresses will depend a great deal on the production of its signal-caller. Since 2013, when Chase Rettig was a senior, the quarterback position has been a revolving door for the Eagles. Rettig was the last quarterback to play 12 or more games in three straight seasons. In the four years since, eight different quarterbacks have been under center. But Brown doesn’t see himself as a variable.